Kem Plastic Playing Cards is a 60-year-old company specializing in one product playing cards 100% cellulose acetate plastic. Kem plastic playing cards contain no vinyl which is the raw material used by all other playing card manufacturers for their "plastic" playing cards. 2Â¼ inches wide x 3Â½ inches tall (Bridge Size) AKA "Narrow"
2Â½ inches wide x 3Â½ inches tall (Poker Size). AKA "Wide"
KEM cards can handle the wear and tear like no other brand of card in the industry. 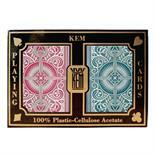 Kem Plastic Playing Cards is Synonymous With Quailty.